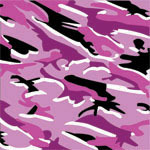 A classic military camouflage pattern with a girls favorite color. In shades of pink, white and black, mix the toughness of camouflage with the girl power of pink! This is a Full Color design that is printed on repositionable material for an effortless bubble free installation with a goo free removal.